Aluminox has completed two vessels, Olympic Zeus and Olympic Hera with Ulstein Verft in 2009. It is an environmental friendly ship in all respects. The ship is built according to Der Norske Veritas class Clean Design. Also, catalytic reactors for minimum NOx emissions are installed. A Green Passport complying with IMO ship recycling recommendations is issued. “OLYMPIC ZEUS” is built with a hotel compliment with permanent capacity for 68 persons. Low noise and vibration levels are recorded in the accommodation. TV and DVD are installed in all cabins and day rooms, conference room with overhead and internet connection facilities as well. We in Aluminox were very proud to cooperate with both Ulstein Verft and Olympic Shipping. We supplied and installed the galley the scullery and the mess room (34 seats) equipment. The main galley has in its center the cooking equipment. The cooking range comes with heavy duty tilting hot plates for easier cleaning and maximum hygiene. The gold version of MKN’s combi steamer, the most advanced combi oven at the moment. In between, a neutral cupboard is placed for supporting the cooking range and the combi oven. On the back side, a tilting pan and a deep fat fryer are installed. Heavy duty stainless steel furniture are installed around the main cooking group. All surfaces are joint together with special stainless steel profiles for easier cleaning. Special care has been taken in order to maximize the use of space and to build the stainless furniture according to the curved design of the galley. The scullery is designed in a single line that works from left to right. 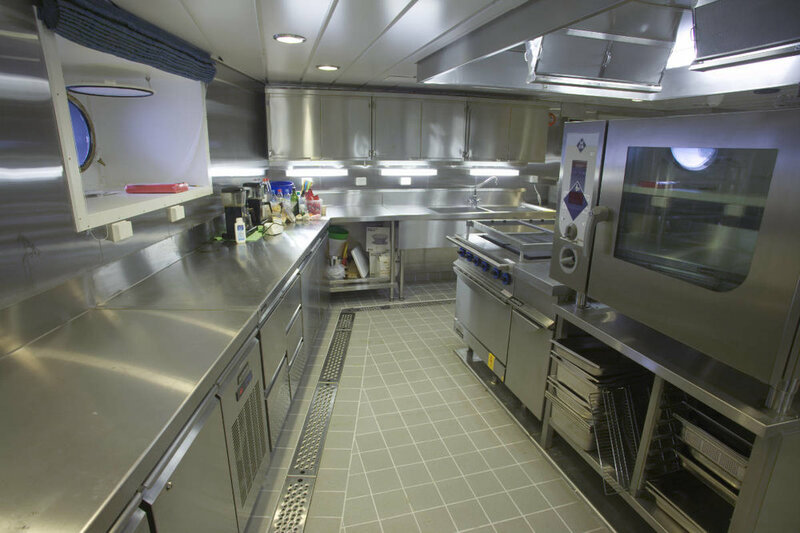 It is equipped with a heavy duty and energy efficient hood type dishwasher that can handle the requirements of the galley and the mess room. The waste disposer facilitates the cleaning process and minimizes the garbage output. The mess room has 34 seats. It is equipped with a 4GN 1/1 bain marie with hot cupboard below and refrigerated cold display with cold well and refrigerator below. The heating elements of the bain marie are outside the water basin and protected from any misuse. In this way, the water basin is seamless without any obstacles and that makes cleaning much easier. With this set up, food is displayed for the crew to eat, but also stored for the crew that is on duty and that will come later to eat. On the back side you will find the water cooler, the coffee machine, the juice dispenser, the stainless steel shelves for the plate and glass baskets and some other smaller size equipment. The Sea Trials took place in the fantastic environment outside the Ulstein Verft. It has been a pleasure and a privilege working with Ulstein and its people.